Homeschooling is a challenge. It’s even more challenging when your spouse doesn’t understand you and your friends, or relatives question the benefits of homeschooling. If only there were some sort of secret decoder ring that came in our cereal box . . . something to help you make sense of your spouse’s emotions and logic, or the insensitive remarks of others. We just need some help so we can understand one another! Can’t we all just get along? We need a secret decoder chart to understand each other. One for him and for her, the homeschool dad and mom. Let’s start with one of the most important homeschool supports available: dads. Their role is significant as our primary support system, significant other, rudder and stabilizer. They are our 24-hour ally, best buddy, and hard-working financier. Here’s the problem. Men and women are gender aliens. Men are from Mars and women are from Venus. Pink talking and blue talking collide in waves of purplish conversations. How can we possibly cope when the two genders are so different? It’s important, though, because our children are counting on us to communicate effectively. We need to talk about important things, such as education, family, and values, when it seems like we hardly speak the same language. I talk a lot about translating our normal, natural homeschool into words and numbers that colleges understand: grades, credits, and transcripts. But long before we make a transcript, other communication issues come into play. We need to translate our normal, natural homeschool frustrations into words and phrases that our HUSBAND can understand. Some might say it’s even more challenging than converting a homeschool experience into educational-eze. Here is my perspective. Men can be so hard to understand. They make everything so . . . what's the word LOGICAL! But my husband claims that I am hard to understand! After all, he says, I could simply start by saying what I mean in the first place. Ha! If only it were so easy! So, I asked my husband, Matt, to explain. Hi there, Mr. HomeScholar here . . . it has come to my attention that homeschool dads sometimes struggle to understand their wives. Lee asked me to help explain the homeschool mom perspective to the dads out there. Never was this Venus/Mars thing more apparent than when we were homeschooling. There seemed to be so many . . . oh, what's the word . . . FEELINGS about everything related to the kids, their education and, surprisingly often, my parents. Most of those feelings were cleverly hidden under an enormous pile of . . . WORDS! The flood of feelings and words that would often greet me after a long day at work could exceed a teenager's ability to text! Often, I would come to full understanding through a painful period of trial and error, using my prodigious communication skills and through the careful employment of strategic clarifying questions like, "Huh?" and "What??" I captured some of those hard-won lessons in a notebook to remind myself that some of the more common expressions Lee uttered did not always mean what they appeared to mean. Upon careful reflection and through the clarity that only weeping can bring, I was able to translate many of these comments and declarations into their true meaning. 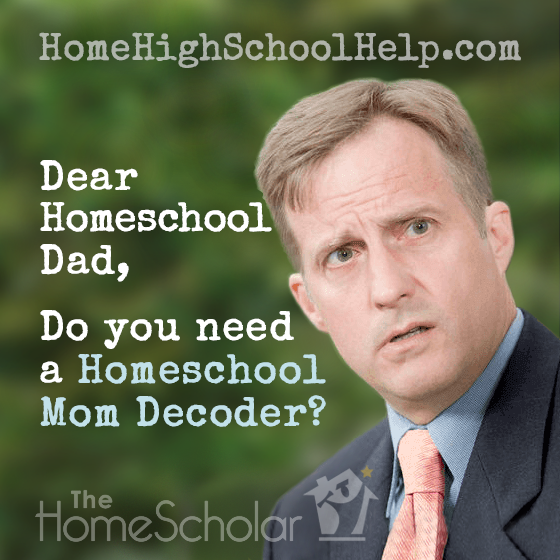 It is in the spirit of love, service and above all, pity for my fellow homeschool dads, that I share this battle-tested wisdom in the form of this "homeschool mom decoder." If I can save one dad from one night spent on the couch, my job will be done. As a public service, I share this Homeschool Mom Universal Translator with your husband. Could you please pass it on to him? Consider it my gift to you. Please share it with your spouse and Facebook friends for grins and pin on Pinterest to review later, when you actually need it! If you click the image, you’ll get a nice large version suitable for framing - on a very long wall in your husband’s office, perhaps! Guess what? Not every mom is the stay at home parent. Some dads are the primary educator. There are wonderfully successful single parents as well. Their voices are so important and vital to the homeschool community. 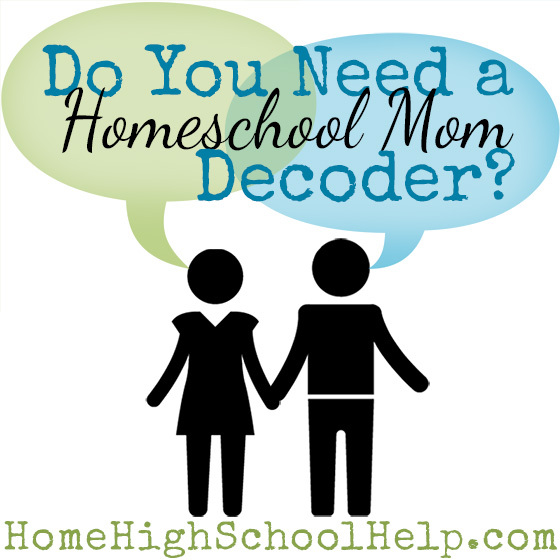 Suzy says this decoder is helpful even for single parents. She was thankful for the reminders, because her inner-voice speaks the mom words, and she needed help translating her own thoughts into what she really means. A homeschool dad felt slighted by the implication that moms are always the home educator. “Wives of male lawyers are not called ‘lawyer moms’ so I’m not sure why husbands of homeschool moms are ‘homeschool dads.’ I AM a homeschool dad, in that I have been my daughter’s primary teacher for 6 years. My wife works full time as a public school teacher. I appreciate that we are an extreme minority. Please appreciate that the label ‘homeschool dad’ has a radically different, and mostly unappreciated definition for those of us who do this job." Rachel suggests the comparison to professionals working outside the home as well. Every homeschool situation is unique. At the same time, many of our parental conversations may seem like the classic communication played out in sitcoms night after night on TV. These are the times that try men’s souls. But it’s not just our spouse that can be a problem. Parents need a translator to deal with disapproving, insensitive relatives. You know the type . . . the ones who make you feel like DIRT. Here is your very own copy of my Disapproving, Insensitive Relatives Translator, DIRT. For my French readers, it is called the "Translator Universalle for Relatives Disapproving." You see, sometimes what your friend or relative says doesn’t actually reflect what they are thinking, and you need a translator to figure out what they really mean. While it starts with understanding, at some point we may need to reply to disapproving on-lookers. In all seriousness, I don't recommend you start with a snippy response. Starting a battle rarely wins the war. Instead, begin with the assumption that they simply don't understand and once you explain it to them they will get it. Try to answer their questions. Once in awhile, you get a real piece of work, like a relative or friend who decides a pop quiz is in order. Perhaps you have met a person like this. As soon as you mention that you homeschool, they decide to provide a test to see what your child knows. Rude! How do you respond to this kind of behavior? My husband's family is filled with teachers - FILLED! I've been grilled so many times, I feel like a panini! Sometimes comments can be flat-out rude, but other times it's truly ignorance about homeschooling. In the beginning, try to assume they are ignorant and look at it as an opportunity to educate them. You can find reliable homeschool statistics at NHERI.org. When you see news reports and stories about successful homeschooling, pass them along. It won’t do any good to even discuss it with some people; there comes a point where you have to politely and sweetly state, "This our family's decision and it does not concern you. Please do not question my children this way." I remember having a birthday lunch, completely surrounded by certified teachers. One woman grilled me for a long time, using words I simply didn't understand. Finally, I gave up trying to understand and said, "I don't know what you are saying, but I know one thing, I'm trying to teach my children to love reading the same way I'm teaching them to love their Bible. I don't need to understand those words you are telling me. I just have to teach them to love reading." Later, I heard her tell the truth to another teacher sitting next to her. "I didn't understand what I said either, it was just a question I got last week on my Master's program test and I thought I'd ask her." Unbelievable! Whenever you hear something negative or are dealing with friends who don't support homeschooling, remember this: know your child and trust yourself. Homeschooling is a decision you have made because you know the full story about your child, their needs, and your family. Based on this complete understanding of the issues, you have made this decision based on careful analysis of the facts. You are the ultimate authority on this decision, because you are the only one with full understanding of the situation. Trust your judgement in this. These are the moments we will look back on and cherish as we remember our homeschooling years, giggling together. “Remember when the neighbor said that?” One day you too can look back and laugh! Would you like to print the Disapproving, Insensitive Relatives Translator (DIRT)? 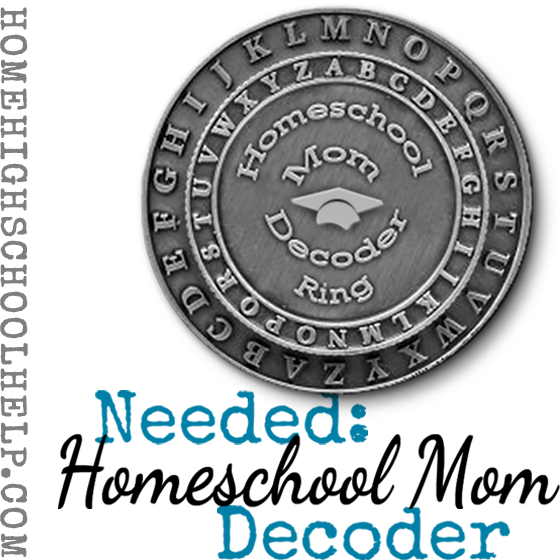 To share the Homeschool Mom Secret Decoder infographic, grab the embed code below! 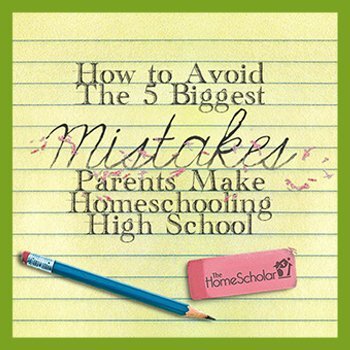 FREE Workshop: "How to Avoid the 5 Biggest Mistakes Parents Make Homeschooling High School"
Avoid Stumbling Blocks and Pitfalls on Your Way to Homeschool Graduation! • The Second Mistake may leave your child unprepared for college! • The Third Mistake may result in the loss of thousands of dollars in financial aid! • The Fourth Mistake may cause your child to be lost in the crowd during college admission! • The Fifth Mistake may render your kid unable to gain admission to the college of their dreams! You already have kids, curriculum, pens, and paper ... now you just need to find the faith! When you homeschool high school, sometimes the only thing separating success from failure is faith and a friend. This book will give you both! Imagine sitting across the table with a dear friend at your favorite coffee shop, sharing struggles and scriptures with each other. 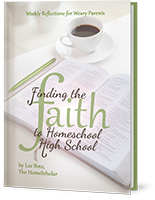 Let Lee Binz, The HomeScholar, be that dear friend who can lift you up with scriptural hope and encouragement. If you are a beginner to homeschooling high school, consider the High School Solution, which provides detailed training on homeschooling all the age groups, from middle school through senior year. The resources included give specific help for all stages, from getting started, planning high school courses and understanding high school testing, to college admission and scholarships. Get complete instruction for choosing curriculum, encouraging delight directed learning, and teaching advanced subjects through training classes for parents, all with handouts or workbooks plus articles and templates. Copyright © 2018 The HomeScholar LLC, www.HomeHighSchoolHelp.com. Text may be reprinted without permission if used in full, except for use in a book or other publication for rent or for sale. 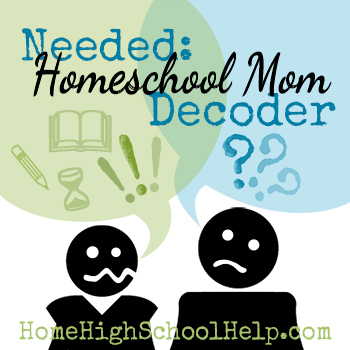 Reprint must include this copyright, bio (below), and the original URL link (https://HomeHighSchoolHelp.com/homeschool-mom-decoder).